For Indoor Banners Or Outdoor Banners Todd’s Graphics To Go Has You Covered. We are the banner experts and remember, if you want to save up to 50% on your next banner purchase, order early. We have banners of all types available. We have vinyl banners available in a wide variety of colors and sizes as well as full color printed banners that are available in all sizes and budgets. We also supply affordable paper banners for temporary or indoor use. We can help you with your banner needs. If you are not sure what kind of banner would be best for you, Todd’s Graphics To Go can help you make an informed decision. Give us a call at 407-322-2923 if you have any questions and we will be happy to answer them. Our banners are of the highest quality. Every banner can be customized for your needs. We treat banners a little differently than most sign shops. Most sign shops use a roll of vinyl material so everyone’s banner has to be the same color and sizes are limited. We make each banner custom, so if you want a specialty banner it won’t cost any more. There’s no need to over pay just because you want your banner to stick out. Our vinyl banners come with a sewn edge and grommets or pole pockets, to ensure your banner will both last and be easy to use. 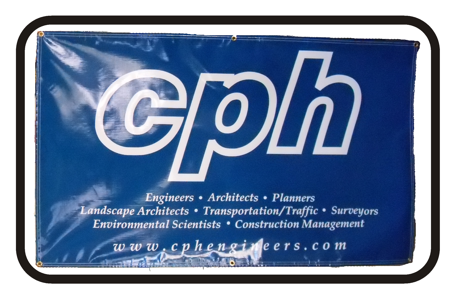 These vinyl banners work well for yearly events because each year we can change some information to make it reusable. Reusable banners can save you money. Reusable banners are also a more environmentally friendly way to use banners. We can also provide you with full color printed banners. These banners say a lot in just one look. You can set your company apart with a full color advertisement. A printed banner doesn’t cost as much as you might think. These banners are very affordable and can fit in any ones budget. Get an affordable full color banner for your next event by ordering early. Don’t be afraid to promote. Same something in a big way with an indoor display. We have a banner to meet your needs. An indoor banner can help to direct and inform your customers. Vinyl banners are great for indoors too. The vinyl banners can be used to promote events that you’ll repeat but may need slight changes to the verbage on the banner, such as monthly sales or promotions, birthday banners, special events and the like. We have digitally printed banners for every need. We provide displays, two sided banner stands, table throws, backdrops and more. Stand out at you’re next event with an inviting and intriguing appearance. A paper banner is perfect for a one time use banner on a budget. These are one or two colors on a colored background and can be the the answer to your needs with breaking the bank. Let us show you how good and affordable your message can be.